This old, sub-standard pool and spa underwent a metamorphosis, emerging from its renovation as a beautiful, serene, inviting space. The project entailed the complete overhaul of the 4,000 square feet pool to complement the quality of design and high level finish of the rest of the property. 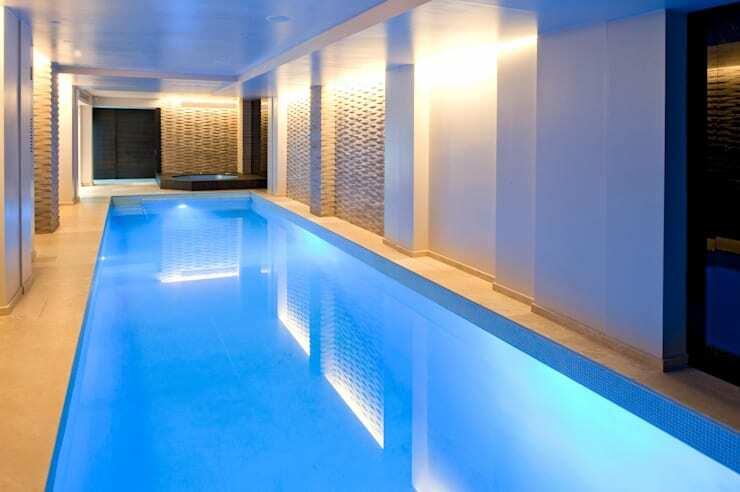 The warm, clean look was achieved by using natural stone on the floor and walls combined with black mirrors and dark stained wood panels setting of the new mosaic tiles in foggy blue in the pool. The lighting system enhances the effect – it is dimmable and fitted in recesses in the pool surround to wash down the stone strips. The air handling system was replaced and was replaced and all air outlet grilles were powder coated to blend in with the colours of the walls. ["PT"] [Published] Piscinas interiores: mais do que apenas beleza! ["VE"] [Published] ¿Te encantaría tener una piscina techada? ["IT"] Piscine coperte: più che bellezza!